The boss tasked with leading the turn around at troubled St Clare’s Hospice is no longer in the role. Avril Robinson was appointed as the chief executive of the Jarrow charity in March last year but, in the wake of a damming report by the Care Quality Commission (CQC), which graded it as inadequate, managers at the hospice, in Primrose Terrace, Jarrow, have confirmed she no longer works for the organisation. Avril Robinson, who is no longer working as the chief executive officer of St Clare's Hospice. 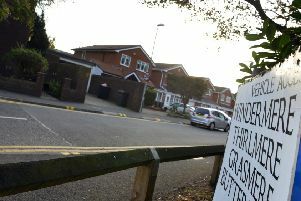 The report followed an unannounced visit by inspectors in September, which led the hospice to shut down its services after the watchdog raised concerns. The check folowed an intial visit earlier in the year, which had also led to criticism over areas of weakness. The document revealed a list of 17 areas of concern, including claims of bullying, a issues over staff training, handling of medicine and its leadership and governance, but graded its care as good. Tracy Woodall, chief executive of Alice House Hospice in Hartlepool, was last week appointed chairman of trustees and confirmed that Paul Jones-King, who was appointed in the newly-created post of director of clinical services earlier this year, will take on the top job in an acting capacity. There will be lots of changes happening and we will be working with the Clinical Commissioning Group and the CQC to bring it all together. She said: “The board is of the opinion Avril is not the person to take St Clare’s forward and she no longer works for St Clare’s. “I have put in place a number of senior people and Paul Jones-King is very experienced, as a nurse and as a clinical director and has worked in a hospice previously. “Sandra Britten, who is my deputy chief executive and also a director of information governance, so knows everything around quality governance, is also working with us. “Nicola Haggan, who is our senior corporate services manager, is an experienced HR manager and she will be making sure contracts and training is right. Tracy Woodall, who is chairman of the trustees of St Clare's Hospice. The hospice is working towards a January relaunch. Miss Robinson could not be reached for comment.